A new week-long ethical festival is to be held in Glasgow, culminating in a two-day celebration of veganism. "The Only Way Is Ethics" will have as its climax, on 5-6 December, the first-ever Vegfest Scotland. Ethics festival organiser Craig Tannock said: "It is not just a vegan event but about using all sorts of entertainment and media to celebrate ethical choices. "From the Monday to Friday, there will be a city-wide programme involving anything that celebrates the theme." Mr Tannock said this would include art, music, cinema, schools and workshop events, with everyone from businesses, campaigning groups, charities, the general public and political organisations being invited to take part. Vegfest already holds annual events in Bristol, Brighton and London and its SECC venture becomes the second large-scale vegan festival to be announced north of the border in recent months. 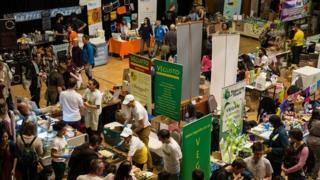 Vegan Festival UK is to hold a one-day event during the Edinburgh Festival. Both events will feature stalls from vegan food, clothing and gift producers, charities and campaign groups as well as celebrity speakers and entertainers. But Mr Tannock, who owns four vegan food and entertainment venues in Glasgow, thinks there is room for both to thrive. "Since we started organising this, we have had the referendum and, whatever side of the debate you were on, Scotland has changed, the UK has changed," he said. "I have never experienced such a level of engagement, so this is very timely as people have realised they can influence things just by having conversations and have become far more aware of ecological and ethical issues as well as about what they eat." Mr Tannock, who is organising the festival along with fellow Glasgow entrepreneur David Scott, holds regular vegan fairs at The Flying Duck. However, he stressed the much larger December event was only made possible once Vegfest confirmed its involvement, with the wider festival being envisaged as an annual fringe around it. Since Vegfest launched in Bristol 12 years ago, it has become the flagship vegan festival in the UK and has helped local groups set up their own fairs around England. Recent Vegfests have featured gigs by rock artists like The Happy Mondays and Peter Hook, DJ LTJ Bukem will play a set at Bristol in May, while Green MP Caroline Lucas will open the Brighton event this weekend. Andrew O'Neill will headline the comedy festival in Brighton, while Sarah Pascoe and Dave Spikey are among other top comedians to have played Vegfest, and organiser Tim Barford says the names of those coming to Glasgow will be announced in the coming months.